Original letter from Joshua Coffin Chase to Sydney Octavius Chase, April 2, 1926: box 49, folder 20.84, Chase Collection (MS 14), Special and Area Studies Collections, George A. Smathers Libraries, University of Florida, Gainesville, Florida. 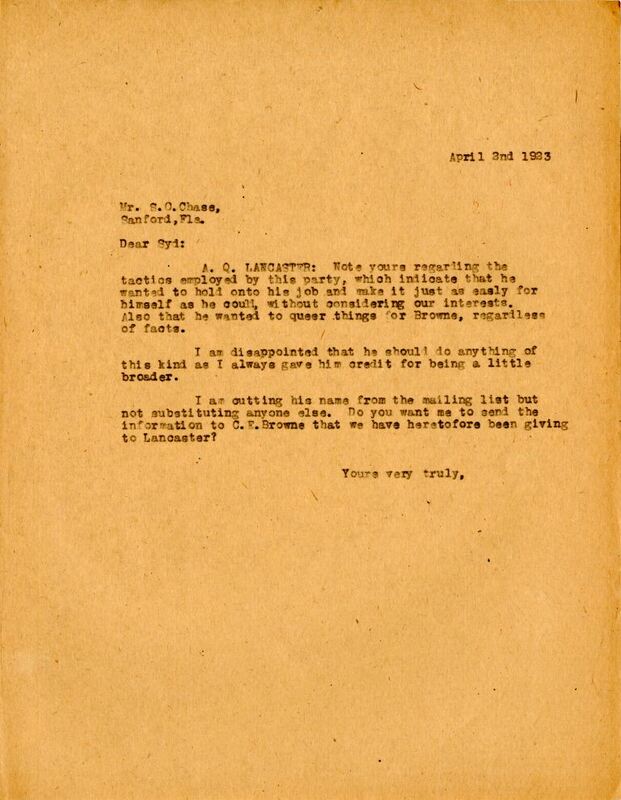 Digital reproduction of original letter from Joshua Coffin Chase to Sydney Octavius Chase, April 2, 1926. A.Q. LANCASTER: Note yours regarding the tactics employed by this party, which indicate that he wanted to hold onto his job and make it just as easly [sic] for himself as he could without considering our interests. Also that he wanted to queer things for Browne, regardless of facts. I am disappointed that he should do anything of this kind as I always gave him credit for being a little broader. I am cutting his name from the mailing list but not substituting anyone else. 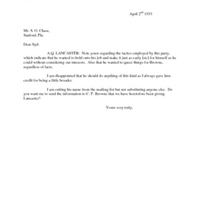 Do you want me to send the information to C. E. Browne that we have heretofore been giving Lancaster? Chase, Joshua Coffin. 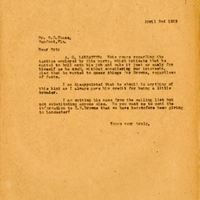 “Letter from Joshua Coffin Chase to Sydney Octavius Chase (April 2, 1926).” RICHES of Central Florida accessed April 22, 2019, https://richesmi.cah.ucf.edu/omeka/items/show/2702.